Fizzlefuzzle wrote: Amazing post, how do you find your new headlights? Are they a lot brighter at night? I want to upgrade but only if it will look nice and give me that extra light! They're amazing on rainy days and night. But they're not that bright in the day time. The company who sold me the lights are sending me some 'inverter' and if that brightens the lights, then the answer to your question would be yes. But not yet. lol. I've have got at DRL setup similiar to the VW golf and the jeeps, where my high beams are constantly on at low voltage when the ignition is switched on. When my blinding Hid's come on the DRL'S turn off. It's another Another alternative to having strips. Even had highway patrol say (that's a good idea) when recently pulled over at a RBT. Sweet thanks! Let me know how you go! I really wanted to buy these lights but I want something that is a lot brighter than stock to use and looks good in the day haha. Are they stick bright during the day or? I was thinking of getting a white LED strip and mount it to the bottom side of the radiator cover so it illuminates the space behind the front grille, is that legal? Hey there Metalstrix great thread by the way. Do you have a daytime pic of your lights on DLR, I really like them but would like to see them in the daylight to see how bright they are. I like this thread, good info and well presented. I think my evo will remain without DRLs - at least for a while. I wonder if DRLs repel roos and wombats etc? Hey guys. 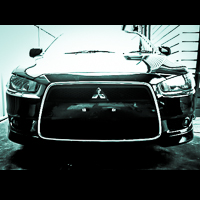 I've updated "Can you use daytime running lights at night". Just incase anyone is wondering. Cheers! What is wrong with Rainbow Pen? These look sick BTW, I hope Mars look into getting these for RHD cars. itsagrantos wrote: [quote=Metalstrix]Audi Looking Projector Lights[/b:505ded0bed] - Intending to buy these in the future. (Note: DO NOT buy from Rainbow Pen) - http://www.ebay.com.au/itm/181180031523 ... 1423.l2648 What is wrong with Rainbow Pen? These look sick BTW, I hope Mars look into getting these for RHD cars. 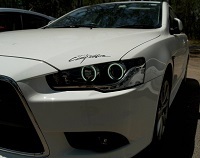 Just on those particular headlights from Rainbow pen are very dim and are charging $800 for it. Whereas the seller in that link are the better quality ones. Yeah I'm thinking of getting those ones once I can afford it. whats the quality like on the mars performance smoked altezza tail lights?